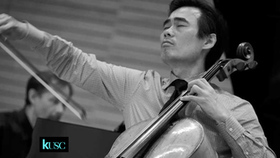 Cellist Sung-Won Yang has performed throughout the world as a soloist and chamber musician. He has given solo and chamber music concerts in prestigious venues as Alice Tully Hall at Lincoln Center in New York, the Salle Pleyel and Théâtre des Champs Elysées in Paris, the Concertgebouw in Amsterdam, the Terrace Theater at the Kennedy Center in Washington DC, the Musikverein in Vienna, the Opera City Hall in Tokyo, Symphony Hall in Osaka and the National Center for the Performing Arts in Beijing. His recitals have also led to other leading cities, such as London, Rome, Frankfurt, Madrid, Prague, Helsinki, Boston, Seattle, Tel Aviv, Shanghai, Sydney and many others. While exclusive artist for EMI-Korea, his first album entirely devoted to Kodály, was "the editor's choice of the month" Gramophone Magazine (February 2003) and "critic's choice of the year" Gramophone Magazine in the UK (December 2003). He was also nominated for best solo album to Edison Awards in the Netherlands (2003). His other recordings for EMI, are works by Rachmaninoff and Chopin with the pianist Ick Choo Moon (2002), the complete J.S. Bach's suites for cello solo (2005), and the complete Beethoven Sonatas and Variations for piano and cello with pianist Pascal Devoyon (2007). These recordings have all received with great response and success from music lovers and critics alike. After his Schubert album with violinist Olivier Charlier and pianist Emmanuel Strosser, appeared under the Decca label in 2009, his recent recordings are Dvorák Cello Concerto with the Czech Philharmonic Orchestra(Cond; Znedek Macal) and Trio Dumky (2010); an album combining jazz, Latin music and la variété française with the ensemble Les Bons Becs ‘Musical get away' (2011); Beethoven's ‘Archduke' trio and Op. 70 No. 2, with trio Owon (2013); and the complete works by Brahms and Schumann for cello and piano with Enrico Pace (2014); two records for Decca / Universal by Trio Owon : The complete recording of Beethoven trios (2015), and For The Future (Olivier Messiaen : Quatuor pour la fin du temps) (2016). 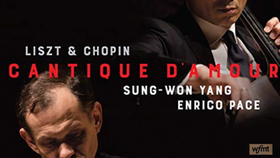 Sung-Won Yang has collaborated with great musicians such as Christoph Eschenbach, MyungWhun Chung, Peter Eötvös, Johannes Kalitzke, Laurent Petitgirard, DongSuk Kang, and Pascal Devoyon. His interpretations of the Cello Concerto by Saint-Saëns, the Brahms Double Concerto, and Variations on a Rococo Theme by Tchaikovsky with the Orchestre Symphonic Français were broadcast by French TV in France and throughout Europe on Eurovision, and are available in DVDs (Goldline Classics). In addition, France Music, NHK (Japan), and KBS (Korea) among other radios have broadcast many of his live concerts. A regular performer of contemporary music, Sung-Won Yang premiered in Asia Peter Eötvös' concerto grosso with Seoul Philharmonic, with the composer conducting, and in Austria with the RFO, Austrian Radio Symphoniker. He also regularly commissions new works to young composers, such as two trios for piano, violin, cello, to very talented Korean composer MinJae Jeon (2014 and 2016) and other works such as with daegum (Korean flute Traditional wood) to Korean-American composer Jee Young Kim (2006) as well as a trio for piano, violin and cello to French composer Pierre Charvet (2006). These works have been world premiered by Sung-Won Yang in Paris, Saint-Nazaire and Seoul. 2016 has been a busy year full of projects : Festival La Folle Journée au Japon, Festival Tons Voisins, les Grandes heures de Saint-Emilion, Festival d'Evian, Sagra Musicale Malatestiana, Rome (Villa Medici). The première of Laurent Petitgirard Concerto in Seoul with the Korean Symphony Orchestra. Henri Dutilleux concerto "Tout un monde Lointain" at the Théâtre des Champs Élysées under the direction of Laurent Petitgirard with the Orchestre Colonne. A first experience as movie producer with "For the end of Time", in memory of the french martyred priests of korea in the 19th century. A live recording of Olivier Messiaen's "Quatuor pour la fin du Temps" for Universal Music/Decca, with Trio Owon and Jerry Chae. 2017-2018 Season : A second recording of J.S. Bach's 6 suites for solo cello Universal Music/Decca, after the first release for EMI in 2004. Recording and concerts at the Chapelle de Notre Dame de bon secours, in Paris. Many concerts in France, Korea, Japan, Italy and England : With Trio Owon and Quatuor Modigliani; Festival La Folle Journée en Région and Festival Owon at Chateau de Chaumont sur Loire (with Trio Owon); Festival Saint-Paul de Vence; recitals with Enrico Pace in Ferrara, Casalmaggiore/Cremona, Bardonecchia, and London (King's Place); Cello Festival in Leon, Spain; Performances with various orchestras in Korea, and also the Royal Philharmonic Orchestra of Liège (with Christian Arming). 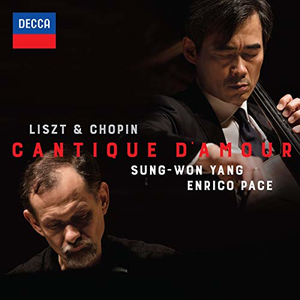 In 2009 Sung-Won Yang creates the Trio Owon with violinist Olivier Charlier et pianist Emmanuel Strosser, from the merger of three musicians from the Paris Conservatory, united by the same passion for chamber music. Their goal is to share with its audience a fully integrated vision of music, committed by a group without boundaries, resulting from a rich and varied artistic inspiration. Through concerts and recordings in England, France, and Korea, Trio Owon already stated its identity made of passion and maturity, like the painter whose name they bear. Painter of Nature, emotion and poetry, OHWON Jang Seung Up, embodies for the trio Owon the universal dimension of Art. Contemporary of Brahms, but from a completely different aesthetic world, it symbolizes the quest of an ideal result of tradition and renewal in the nineteenth century Korea. His story brought to the cinema (Strokes of Fire, prized at Festival de Cannes in 2002), reveals the doubts and commitments of an undaunted artist. Beyond the anecdote (his name's sound summarizes some of our three first names…) here it symbolizes the osmosis between knowledge and modernity. Born in Korea, Sung-Won Yang graduated from the Conservatoire National Supérieur de Musique de Paris and was assistant to Janos Starker at Indiana University in the United States. He was invited to be in the jury of the International Competition of Chamber Music in Banff, Canada, the International Cello Competition André Navarra in France, the International Cello Competition Cassado Japan and the Tongyeong International Competition in Korea. 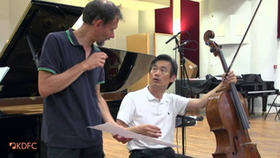 Recipient of numerous awards, he is currently a professor of cello at the School of Music Yonsei University in Seoul, visiting professor at the Royal Academy of Music and Artistic Director of the Festival Owon at Chateau de Chaumont sur Loire in France. Sung-Won Yang plays Pirastro "Passione" strings. He has worked with among others conductors Roberto Benzi, David Robertson, Andrey Boreyko, Mark Elder, Janos Fürst, Eliahu Inbal, Lawrence Foster, Kazimierz Kord, Jiří Kout, Gianandrea Noseda, Walter Weller, Carlo Rizzi, Jan Latham-Koenig, Vassily Sinaisky, Stanislav Skrowaczewski, Bruno Weil and Antoni Wit. Enrico Pace has toured extensively, performing in cities such as Amsterdam (Concertgebouw), Milan (Sala Verdi and Teatro alla Scala), Rome, Berlin, London (Wigmore Hall), Dublin, Munich, Salzburg, Prague and various cities in South America. He has performed at numerous festivals including La Roque-d'Anthéron, Verbier, Lucerne, Rheingau, Schleswig-Holstein and Husum. Enrico Pace enjoys on-going partnerships with violinists Leonidas Kavakos, Frank Peter Zimmermann, Akiko Suwanai and Liza Ferschtman, as well as with cellist Sung-Won Yang, performing with them throughout Europe, the USA and the Asia. Other chamber music partners include cellist Daniel Müller-Schott, clarinetist Sharon Kam, pianist Igor Roma and horn player Marie Luise Neunecker, as well as the Keller Quartet, the RTE Vanbrugh Quartet and the Quartetto Prometeo. He regularly participates in chamber music festivals and has visited Delft, Moritzburg, Risør, Kuhmo, Montreux, Stresa and West Cork. Recent highlights include the Beethoven Sonata cycle with Leonidas Kavakos in among others New York (Carnegie Hall), Athens, Florence, Milan, Amsterdam, Moscow and Tokyo and at the Salzburg Festival and the Beethovenfest Bonn, as well as further duo recitals in the USA, Europe and China; Bach Sonatas with Frank Peter Zimmermann in among others New York, Amsterdam, Zürich, Frankfurt, Bamberg and Japan; a performance at the Scala in Milan of Schubert's Schwanengesang with Matthias Goerne; recitals with viola player Antoine Tamestit in Zürich, Frankfurt and Cologne; recitals with Akiko Suwanai in Japan and at the Wigmore Hall in London; recitals with cellist Sung-Won Yang in Korea and Japan, and solo recitals in among others the Amsterdam Concertgebouw and the Herkulessaal in Munich. With Mr. Kavakos and cellist Patrick Demenga he recorded the piano trios by Mendelssohn (Sony Classical). His recording of the complete Beethoven Sonatas for piano and violin with Mr. Kavakos was released by Decca Classics in January 2013 and was nominated for a Grammy Award. In April 2016 Decca Classics released a CD of the duo performing virtuoso encore works. With Mr. Zimmermann he recorded the Busoni violin sonata no. 2 and the six Sonatas for violin and piano BWV 1014-1019 by J.S. Bach for Sony Classical. In 2011 the label Piano Classics released his highly praised solo recording of the Années de pèlerinage "Suisse" and "Italie" of Franz Liszt.